To develop and validate a multi-scale modelling approach to predict variability and defect formation during liquid composite moulding, capturing the combined effects of material, geometry and process variables. This will incorporate variations in materials and processing behaviour at the macro, meso and micro-scales. In the third year we have completed work to develop understanding of micro-scale behaviour of reinforcements during manufacture by resin infusion. 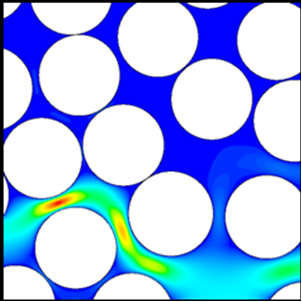 This work has shown that micro-scale permeabilities differ significantly from those predicted using classical models, which has implications for flow within fibre tows during macro-scale impregnation. This understanding has been used in macro-scale modelling as described below. PhD student Frank Gommer graduated in Dec 2013, so that this stage of the work is now complete. 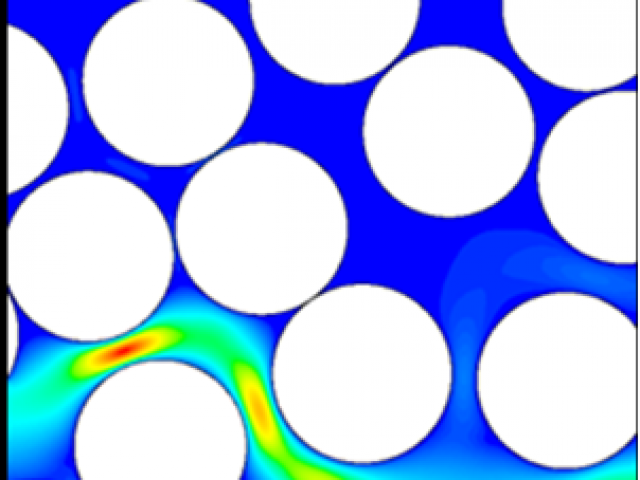 Macro-scale flow analysis has focused on studies of the effect of forming on reinforcement permeability. In particular we have combined the effects of tow path variability and variability during the forming process (positioning of reinforcement layers), demonstrating their effects on flow at the macro-scale using a stochastic modelling approach. To achieve this, a novel meso-scale flow model has been developed, incorporating changes to tow path and shape. The final stage in the work will use this modelling approach to estimate the likelihood of defect formation during resin transfer moulding. Work on cure modelling has focused on the influence of tow orientation variability on the development of process stress/strain. An existing image analysis procedure for woven fabrics has been adapted for use with NCFs and variability of fibre orientation has been quantified.The results have been incorporated in a stochastic model capturing the spatial character of fibre misalignment and the model has been integrated with a thermomechanical cure solver. 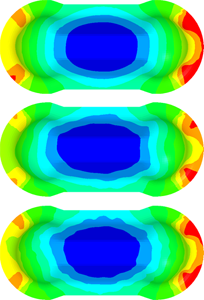 The resulting cure simulation allows estimation of variability in residual stress and its spatial distribution. The final stage focuses on the influence of variability in manufacturing process conditions. 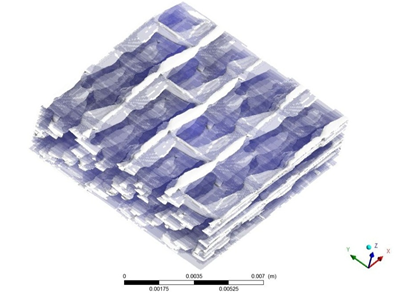 Micro-scale tow permeability model which incorporates the real distribution of fibres within textile composites. Resin flow simulation approach incorporating variability in tow path, ply placement and forming process. Stochastic modelling approach for resin cure based on resin and preform variability.